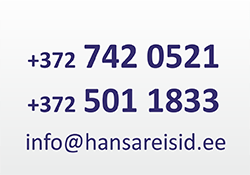 Through Hansareisibüroo you can book and buy ship tickets. Also you can buy tickets for cruises. Contact with us and we will make you an offer. NB! *Linda Line is only for passangers, there is no car places !